-Are you tired of dry, flaky, callused feet? Exfoliating helps but it’s hard to bend and twist just to reach! -Well now there is an easier way! 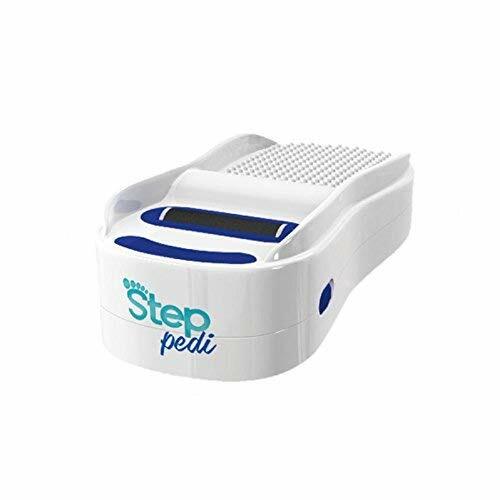 Introducing, the Step Pedi! feet you'll ever see! Simply tap it on with your toe and rest your foot on the Step Pedi. -Step Pedi will do the rest by gently scrubbing the dead skin away! And when you’re done simply empty it in the trash! NO MESS! NO STRESS! -Step Pedi Angled Outed Edges keeps you balance and works on wet or dry feet! -Hands-Free: With a tap of the toe, you can exfoliate your feet while standing, sitting, reclining or even when you are in the bath! -Suction Cups:Holds the Step Pedi on the side of the tub while bathing. -Mess-Free:Traps shavings to prevent mess at home. -Totally Painless & Gentle:High speed & powerful spinning foot tile removes calluses with ease. Even while relaxing in the bath!